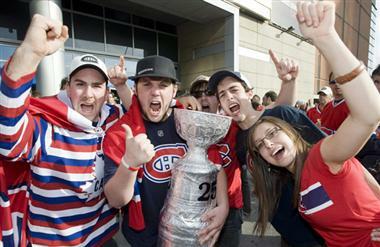 Montreal Fans – Photo Graham Hughes, CP. by James Metcalfe – Pace Law Firm: You know you are living in Canada when a nationally televised leaders’ debate is shifted to another day because it conflicts with the start of the Stanley Cup playoffs. For those of you who may not know it, Canada’s national sport is hockey – ice hockey, that is, not the game played on grass. A televised election debate was scheduled for Thursday April 14, but alas, the Montreal Canadiens were scheduled to play the Boston Bruins that same night. As most Quebecers’ screens would be tuned to the game, the politicians decided to move their debate. That’s how politics and democracy works in Canada. I believe that this demonstrates why people want to come to Canada, and that politicians in Canada are in tune with the wishes of the people. This may be a simplistic answer, but Canada continues to prosper under its motto of “peace, order, and good government.” While Egypt , Libya, and other countries are in turmoil, Canadians know what their priorities are, and the politicians know that they’d better listen up – especially during an election campaign. Update: Montreal won the game 2 – 0 and leads the best of 7 series 2 games to none. Next game tonight in Montreal. No nationally televised debates scheduled.